On November 11 the Church celebrates the feast of St. Martin of Tours while the United States honors Veterans Day. The two celebrations—one religious and one secular—have a lot in common. St. Martin is the patron saint of soldiers and conscientious objectors. At first sight, this may seem incongruous and even contradictory. In reality, St. Martin’s patronage is the meeting together of two long-standing traditions of the Church: just war theory and radical non-violence. The Church is always calling the world to balance these two teachings. In a world of Fallen men and women, it can be difficult to know when violence should be employed and when standing up in a non-violent manner is required. 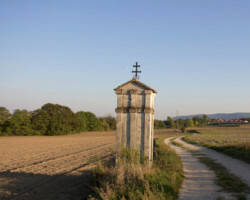 St. Martin’s example as a soldier who eventually became a conscientious objector is a reminder that we are called to constantly discern our choices and actions in light of Christ crucified. St. Martin of Tours gives to a beggar. Much ink has been spilled on just war theory. It is a popular topic in social media and it is thrown around too casually. It is deeply difficult for any war in human history to fully meet the requirements of both jus ad bellum and jus in bello. Setting aside the theological and philosophical arguments on war, it is clear that the Catholic tradition upholds both the heroism of combat Veterans and those who choose to conscientiously object. Some of the latter choose to serve their fellow man during wartime in a manner that does not require them to be armed with a weapon and intentionally cause harm or death to another human being. This long tradition is seen in the Catholic chaplaincy in the Armed Forces, as well as the once common practice of medics remaining unarmed. Combat and military service leads members to form deep bonds that can be difficult for civilians to grasp fully. The reliance upon one’s brother to the right or left in a firefight forges profound connections among men. I witnessed this brotherhood while I served in the U.S. Navy. As a woman, it was something I watched with deep regard and respect. I couldn’t ever fully enter into that brotherhood. First, because I don’t think women belong in combat, but that’s for another piece. And second, there is something about brotherhood that is ontological. It is an aspect of masculinity that is different from femininity. This does not mean the sexes are not equal. It merely means we are different at the very depths of reality. Men connect with one another in combat in a manner that goes beyond words and that extends into spiritual realities related to their God-given masculinity. This brotherhood is best understood through Our Lord’s words to His Apostles in John 15:13: “No one has greater love than this, to lay down one’s life for one’s friends.” War brings this reality to the forefront. Each new day brings the possibility of death, including heroic death. Many service members have given the ultimate sacrifice not only for their country, but for their brethren in arms. It is indeed a mark of heroism and fortitude to jump on a grenade in order to save one’s brothers nearby. The Medal of Honor was created for such heroism and it is an awesome thing to behold. This heroism is not only illustrated by service members who go to war as combatants. For Catholics, some of the most moving pictures from wars, since the advent of the camera, have been of our priests offering the Holy Sacrifice of the Mass for those about to go into combat. The pictures of Masses before D-Day are truly inspiring. The same can be said for the more recent pictures from Iraq and Afghanistan. It is the ultimate act of non-violence as the un-bloody sacrifice of Our Lord—who sacrificed Himself for us—is made present to those who may die in the hours to come. Catholic chaplains bring the Sacraments to those serving in war zones. They bring the Divine Physician to those in need through the Sacrament of Reconciliation. Those who may have wandered far from God are able to return to Him before they meet their ultimate end. The Eucharist, made present through the priest, nourishes those who suffer the torments of war. These very same priests put themselves in harm’s way to offer Last Rites to the dying within their reach. Yes, the hell of war is sometimes necessary, but Christ is truly present in the radical non-violence of His priests. This radical non-violence in combat—often from conscientious objection—has been portrayed in multiple movie and television programs in the last two decades. The most recent is Mel Gibson’s Hacksaw Ridge, in which one godly conscientious objector saved hundreds of lives. I myself could not watch the movie because it is too gruesomely violent for me, but my husband relayed to me with tremendous awe the incredible feats of the real-life main character. This man chose to exude Our Lord’s call in love by saving wounded men at considerable risk to his own life. The other example that comes to mind I regard it as one of the greatest television events of my lifetime: Band of Brothers. My dad told me to watch it years ago when I was still in the Navy. I purchased a copy and ended up watching all ten episodes in one sitting on one of my days off. To this day my favorite episode is “Bastogne.” The episode primarily centers around “Easy” Company’s brutal winter outside of Bastogne, Belgium. Medic Eugene Roe is the focus of the episode as he treats and serves the men of his company, unarmed, while suffering physically, mentally, and spiritually. The entire series is a dramatization of real events of World War II in the European theater and this episode not only reveals the heroic sacrifice of those who choose service through non-violence, but how we are called to persevere in the most brutal of circumstances. The end of the episode is heart-wrenching and tragic, but it highlights this message of perseverance even in the midst of despair and seemingly pointless violence against innocents. We are called to serve as Our Lord served; we are to empty ourselves completely in love regardless of the circumstances. St. Martin is an example to us of how the Church unites the necessity of just warfare with the call to radical non-violence. His patronage continues to be relevant in an age—not much different than any other—when violence demands a response, whether it be a just use of force or radical non-violence. There are times justice demands that we fight through force. There is little doubt that human history has been filled with horrors–such as genocide–that require the use of military force. It is also clear that not everyone is called to serve God and their nation in this capacity. The heroes of Veteran’s Day are both combatants and conscientious objectors; as long as their work is ordered to God. May St. Martin of Tours pray for all our Veterans on this day and every day.